It’s a pity, really, that the Grand Prix races aren’t held on Saturdays. Or perhaps it’s a blessing; if the last race of the Grand Prix had been held on Saturday the Graebers would still have people hanging around the house come Monday morning! With Michael Jackson on the big screen over the pool table, dancing and live music at the other end of the house, separated by a gauntlet of food and drink, there was no reason to leave … ever. There was even suggestion that we should just hold the Annual Banquet at the Graeber’s house next year after the last Grand Prix race. And much thanks to the Graebers and their helpers who made sure that our sweaty bodies were rejuvenated with sufficient liquid carbohydrates and grape derivatives! Even for those familiar with Pochet Neck and Nauset Heights, this 4.5 mile jaunt is a daunting course [Google Earth flyover] with a challenging climb out of the National Seashore and up the gravel of Pochet Road at the 4 mile mark. Even Joe Navas misplaced 20 seconds from the beach to the finish tape. Leading off from the start, Joe took the individual finale victory in 23:36 tightly trailed by Tom Deeg who posted 23:56 after taking the long away around to the finish. In the women’s race, Katie McCully narrowly gapped teammate Robyn Argo by 5 seconds, 31:28 to 31:33. That 1-2 finish coupled with a strong kick to 4th position by Brandon Bausch over Happy Trails’ new recruit Brian Reske, clinched the Mixed Team division, without question or challenge, for the Nauset Warriors. The overall team win of the day went to Level 5 but even with a couple of last-minute race wins, it wasn’t enough to put down the Old Dogs who held on (with the help of Rick Copley) for the series win in the Men’s division and 2nd team in the overall division. The overall team honors in the series were taken by Happy Trails who reported in with 16 team members, scoring 12 of the top 20 finishers in the finale race! That’s the way to lockout a finishing chute! Sporting chic race kit after the race, Wicked Old Warriors is amped for next year’s series while Happy Trails surreptitiously displayed their new T-shirt design to any passers-by who happened to stand still long enough. In the overall series point standings, congratulations are due to Nauset High School runners Brandon Bausch and Robyn Argo who scored convincing wins with 4484 and 3564 points respectively. Without snow days, Brandon would have been easily into the 5000 point range, a score rarely seen in the CCAC Grand Prix. Many thanks to all of our hosts, timers, runners and walkers for the 2009-2010 Winter Grand Prix and we’ll see you all again in 11 months! Preliminary results for Grand Prix #8 have been posted. Due to a mix of walkers in the midst of the runners and several walkers who didn’t report times, we’re holding final tabulations until Wednesday, 27 January. Please review your results for time, place and team accuracy and send updates to ccac@capecodathleticclub.org as soon as possible. More on the finale party and final team results to come! Truly we run for days like these! 45F with a light breeze from the northeast … but even a growing overcast couldn’t take the life out of this party. After 3.3 miles over a deceptively challenging and in spots, icy and snowy course, enough to cause a bit of a steeplechase at the intersections of the bike path and Jones Road, we managed to climb the final hill to Kurt’s house where we were greeted with delicacies from here and abroad: venison from New Zealand, spiced buffalo burgers, fresh winter mussels, shuck-it-yourself cherrystones, oysters, cakes, pasta salads, and more. The fire pit in the back yard kept everybody toasty as the clouds continued to gather but rain was late coming and no one was bothered by drops from the sky … although a few were challenged by the ski slope to the fire. Many thanks to Kurt for hosting and for building the new CCAC clubhouse. We think we’ll start holding all of our races and meetings here from now on! Oh, the race? Joe Navas (17:54) and Dawn Varnum (22:05) took individual titles as Joe led an attempt by Level 5 to overtake Old Dogs in the men’s division … but alas, although they triumphed at this race, with one race left on the calendar, a title victory is not to be had by Level 5 this year. Happy Trails, led to the finish by new team members Paul Hufnagel and Dawn Varnum, recruited 13% of the race field to land the top overall spot by one point over Level 5 but their 10 points in the mixed division, that’s a 5th for the men and a 1st and 4th for the women, wasn’t enough to put down the Nauset Warriors as they came in with a 2nd, 2nd and 3rd for 7 points and top honors in the mixed division. The best possible score in the mixed division by the way is 4 (1st, 1st, 2nd) but we’ve yet to see a 4 recorded by any of our mixed teams thus far. The question for the finale is: can Happy Trails fend off a late series charge by Old Dogs for the overall team title? Old Dogs will need to do some heavy recruiting this week since they’ll need some spoilers in the mix to knock Happy Trails down a few places! Next week, join us in Orleans once more as we visit the fine home of George and Rosalyn Graeber for the finale of the 2009-2010 Grand Prix. Beautiful views, a treacherous course, fine food and wine and live music by the house band await! Only a few more Grand Prix races left on the calendar and that means it’s almost time for the banquet – awards, dancing, dining, and celebrating! This year’s banquet will once again be held at the Dennis Inn and will start at 6:00pm on Saturday, 6 February. Print out the flyer and send it in the mail or bring it to one of the Grand Prix races and we’ll see you in Dennis. On Sunday at 11:00am, we’ll meet at Hanlon’s Shoes in Hyannis for Kevin’s 10 Miler and the sort-of-but-not-entirely-annual Day After fun run. If you don’t want to run the full ten, that’s fine – we have some great alternate courses or you can run out as far as you want on the 10 mile course and then turnaround and come back! 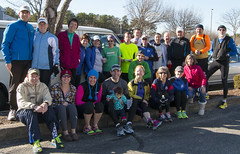 Joe Navas (24:57) and Anne Curi-Preisig (29:39) topped the 250 strong field at the 2010 Cape Cod Roadrunners Winter Fun Run on January 10th over icy roads and through biting temperatures. Ice by the lodge forced this 4.9 mile 5 miler down to about 4.7 miles but no one seemed disappointed in this opportunity to set a 4.7 mile PR. Everyone was in attendance as the race featured prominently in the CCAC Grand Prix, the Greater Framingham Running Club’s Grand Prix, the Hockomock Swamp Rat’s Grand Pr*cks 2009-2010 Series, and as an excuse for the Thirsty Irish Runners to have yet another party. And the CCRR and the Weary Travelers Lodge did not disappoint; plenty of chowder, fritters, a busy bar and a big screen TV kept the party rolling well into the afternoon. In the CCAC Grand Prix standings, Brandon Bausch continues to dominate the men’s board with 3003 points, leading his nearest competitor, Jason McWhirter, by 177 points. On the women’s side, it’s a head to head race between Robyn Argo (2336), Polly Papsadore (2321) and Susan Lowry (2318), who are all separated by no more than 20 points. Team competition has gotten fierce as new team Mixed Nuts, coached by Tom Davis, joins the fray. Happy Trails and Old Dogs are tied for 1st in the overall standings while Nauset Warriors hang tough in 3rd. The Warriors are singularly adept at placing runners where it counts though, virtually locking up the Mixed division win with this race. 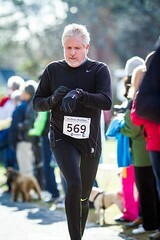 Despite injuries, Old Dogs continue to trounce all comers in the Men’s division. Our next stop is Orleans and the home of Kurt Martin. The weather forecast for the weekend calls for a change in the weather with warm temperatures and some heavy rain so maybe we’ll be able to see the bike path by Sunday. Ample seafood should be in store regardless. 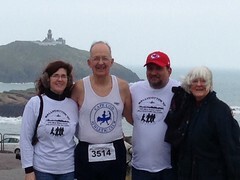 The CCAC will enter 4 teams in the 2010 Boston Marathon. If you would like to compete for a CCAC team, please contact Bill Masterson by 1-31-2010. There will be 15 runners on each of the 4 teams. The 3 fastest times on each team will count in the team scoring. There is no cost to join a team, and a slow race does not hurt the team. Join a team and help the club! The ONLY requirement is that your CCAC dues are paid up through 4/20/2010, and that you are officially registered to run Boston. Grand Prix # … ? Frankly we’ve lost count! 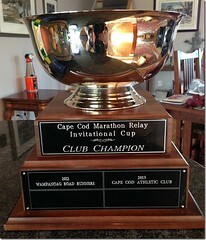 Anyway, make sure you get to this weekend’s Grand Prix which will be held in conjunction with the Cape Cod Road Runners’ Winter Fun Run at the Weary Travelers Club in Monument Beach. Remember that start time is at 10:30!! The chowder and the clam fritters will make up for whatever pain you put yourself through on the course … and it really is a great course. 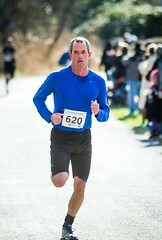 Where else are you going to set a 4.9 mile PR?